The 4.3 inch screen with a HD resolution of 540×960 pixels has behind the 3D LCD technology. The tablet does not behave to well when outside is a bright light. At its base you will find 4 capacitive buttons which are very sensitive. Their role is to: Search, Back, Menu, direct output from any application on your desktop phone. You can also view 3D images and videos. The sound comes from behind, the speaker being placed between the two 5 megapixel cameras. The sound is loud and clear. The 3.5 mm jack is positioned higher, easily accessible. 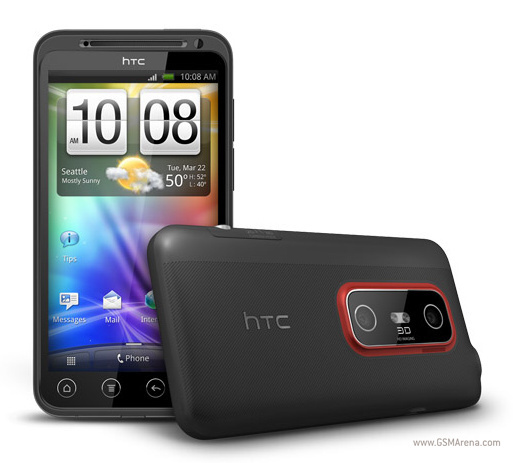 The Evo 3D HTC smartphone comes with a dual-core processor at 1.2 GHz, 1 GB RAM, 1 GB storage space and an 8GB microSD. The graphics is supported by a powerful GPU: Adreno 220. This smartphone runs Android 2.3.4 Gingerbread with Sense UI 3.0. It moves perfectly in browsing and applications and also you will not find any errors through Sense. Quality experience is offered. Plus that, HTC has promised that into the first part of 2012, they will bring Android 4.0 Ice Cream Sandwich on HTC Evo 3D. On the top of the smartphone you will find the power button which has the role in locking and unlocking the screen and the 3.5 mm jack. On the left side you will find the microUSB port which gives you the opportunity to connect the smartphone to computer or to charge the battery. On the right side you will find the buttons for volume control and the ones for starting the camera and also the 2D and 3D modes. The last two are metal, and the one to trigger and capture the image is round and quite large. To access the 1730 mAh battery, microSD slot up to 32GB and the SIM card slot the battery cover must be removed. Operation is easy compared to other phones where this operation becomes a real pain. There should be a positive point for the Evo 3D. It has two 5 megapixel camera on the back, accompanied by a dual LED flash, with autofocus and a secondary 1.3 megapixels videocall camera. 3D pictures have a maximum resolution of 2 megapixels; it records 3D at 720p with 30 fps. The battery has 1730 mAh, but the 4.3 inch 3D LCD screen consumes a lot, but this smartphone charges it’s battery quickly.